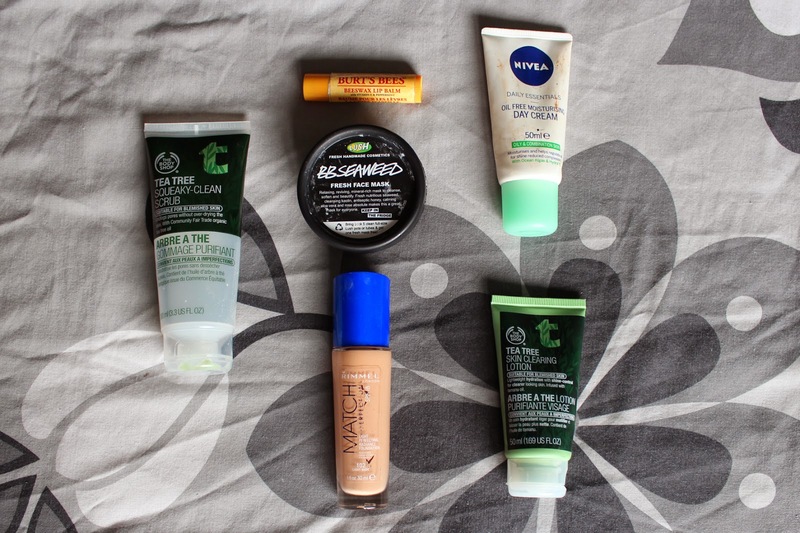 Today I have my first Empties post for you! I never thought I'd ever be able to write down a post like this because as of late I've become a bit of a product hoarder! But over the past two to three months I've finished quite a lot of products and saved them from going straight into the bin! Also this is the second time I'm writing down this post, as I somehow managed to copy and paste over the whole post and save it so that I couldn't go back to the old form - damn it. But do I get plus points for my effort? The Body Shop Tea Tree Squeaky-Clean Scrub: I've finished another one of these face scrubs. I love it for exfoliating because it leaves my skin really clean and fresh and isn't too harsh either. Repurchase? Yes I would repurchase this product! The Body Shop Tea Tree Skin Clearing Lotion: I have to say I unfortunately haven't seen any difference on my skin after using this product. But I did like it as an evening moisturiser and the tingling feeling it left on my skin. Repurchase? No because as I said I didn't see any benefits. LUSH BB Seaweed Fresh Face Mask: I've gone through this face mask quite quickly because it's just a small tub. I do think it feels really nice and exfoliating on my face. Repurchase? Probably not because it's quite expensive for such a small product. Nivea Daily Essentials Oil Free Mouisturising Day Cream: I've used this as a daily moisturiser and before applying my make up. I've actually temporarily replaced it with another one and just finished this tub. Repurchase? Maybe, but if so I'd go for one for normal skin because mine isn't really oily. Rimmel Match Perfection Foundation: I've also finished the first product I've ever blogged about haha! I still really like this foundation, even tough this particular shade is a bit too dark for me. I've used it when having a tan and unfortunately I ran out on the day when I was having a tan - ugh bad luck eh? Repurchase? Yes I would repurchase because the formular is really lovely. Burt's Bees Beeswax Lip Balm: I'm a bit sad about this one being an empty! I love the peppermint flavour and it's soothing on my (apparently always) chapped lips! It's also a non-greasy lip balm which I like. 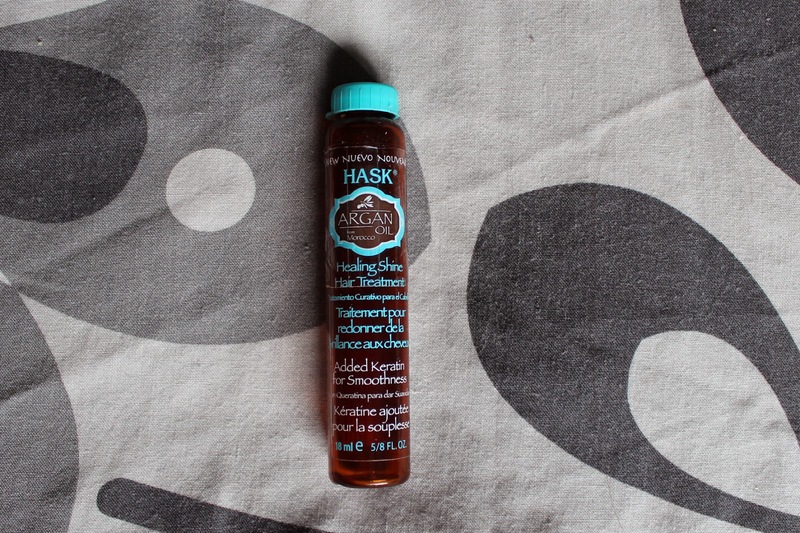 HASK Argan Oil: Unfortunately I didn't really enjoy this product. 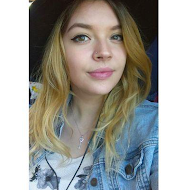 Okay I did, for like the first three times but after that I felt like it didn't make a difference to my hair at all. I was just left with greasy-looking hair, even when using just the tiniest amount! Repurchase? No I wouldn't repurchase. Repurchase? Yes if I can find it on offer, otherwise I'd opt for a cheaper alternative just because you go thorough it so quickly! The Body Shop Body Butter in Strawberry and Passionfruit: Okay that I've finished two tubs just shows how much I love these! The body butters feel so luxurious, hydrating and leave your skin really smooth. I'm not the biggest fan of the strawberry one, it smells a bit to artificial for me, but as I said passionfruit is my favourite scent (and Vineyard Peach!). The Body Shop Body Lotion in Japanese Cherry Blossom: This body lotion skins in so quick and leaves the skin smooth and smelling nice. I have to say that sometimes the scent can be a bit overwhelming though. Repurchase? No simply because I'd go for a cheaper alternative. I Love Bubble Bath & Shower Gel: I've actually used up several different bottles of this in different scents over the past few months. It creates great bubble baths and smells really lovely (all of them!). And it's a handy little shower gel for weekends aways. 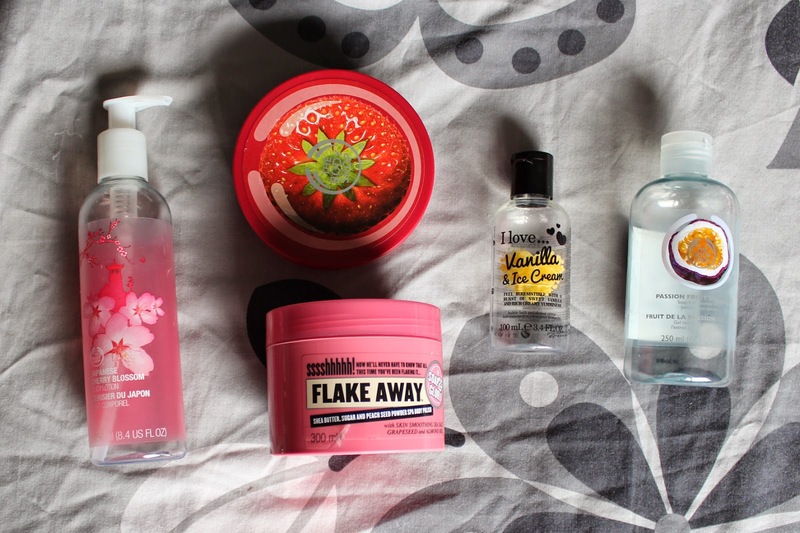 Soap & Glory Flake Away Body Scrub: This is just a great body exfoliator and especially good for getting your legs summer ready. I've also used this to prepare my skin for fake tan, and to get rid of it. Also it smells so delicious! Repurchase? Yes I would repurchase! essence nail art express dry drops: I'm the worst when it comes to being impatient when my nails are drying! My friend recommended me these drops and they are amazing. My manicure is done way faster whenever using this product. I have to say that your hands will be oily after using this, but I just wash the oil of and I'm good to go! Repurchase? Yes I already have! 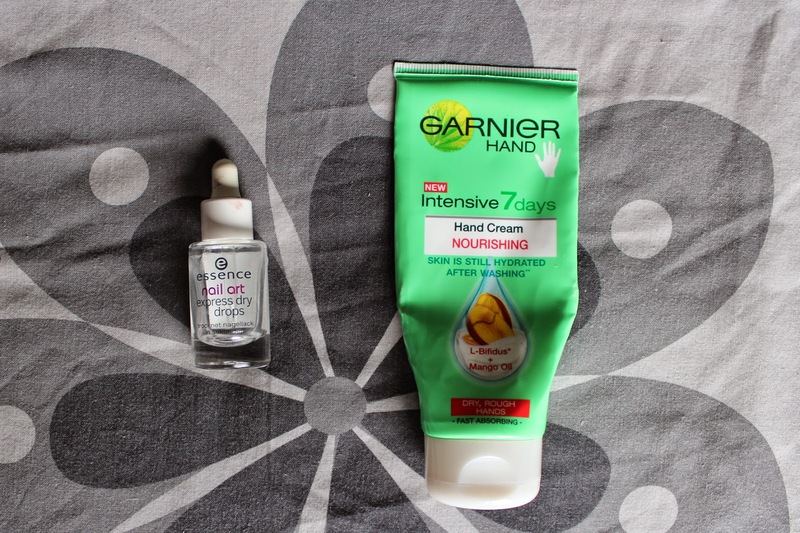 Garnier Hand Intensive 7 days Hand Cream Mango: A lovely fast absorbing hand cream that doesn't leave my hands feeling sticky - perfect! I like how quickly it sinks into your skin and leaves it feeling nourished. I've had this product for a while and just finished it now, so I'd say a little goes a long way. 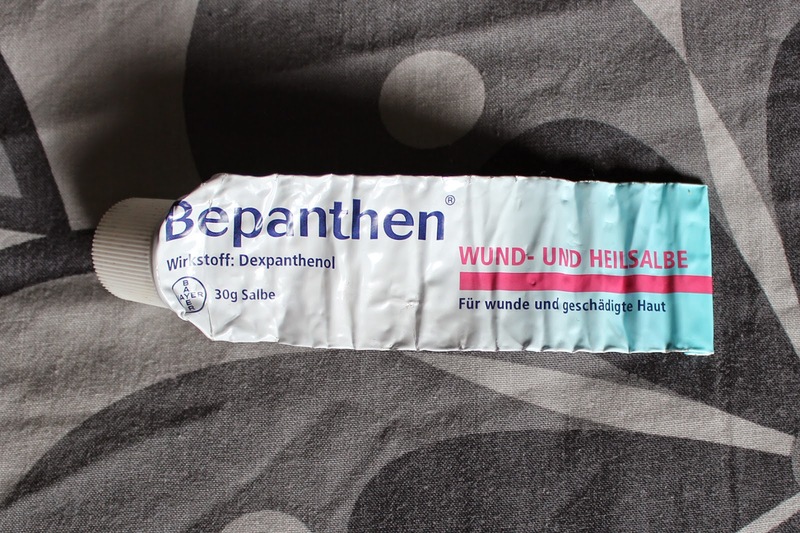 Bepanthen Wound Healing Cream: This is a forever repurchased product in my family! I don't even know through how many of these we've been through. Yep I've always been the girl that was coming home from playing with the bloody knees or picked open mosquito bites. Nowadays I use it for minor cuts (thanks to lovely cats! ), the odd mosquito bite and also on my lips I've they are in really bad condition! 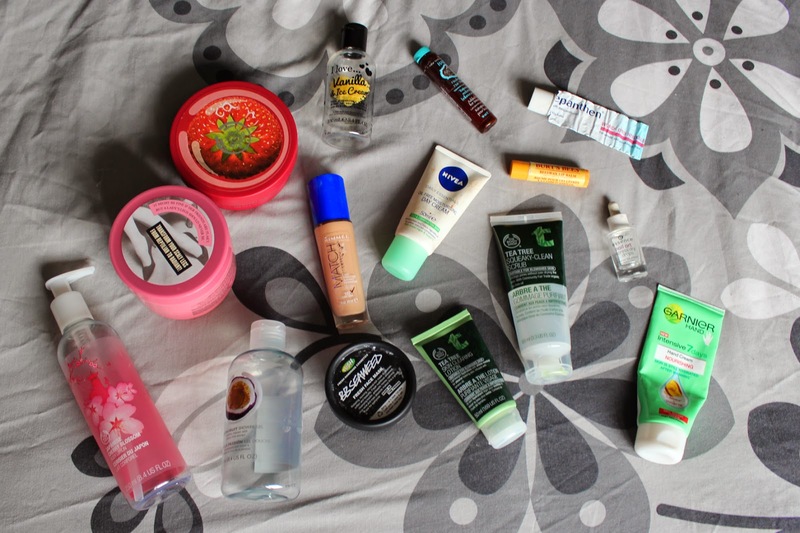 I really hoped you enjoyed this Empties post. Let me know if you did and if I should do another one! Have you tried any of the products I've mentioned?